Wuxi Junteng Fanghu Alloy Casting Co., Ltd. specializes in the production of heat & wear-resistant alloy steel castings with precision & centrifugal casting & resin sand molding processes.Our current capacity of finished castings is 5000 tons / year. Our main products include heat treatment fixture castings, heat treatment fan blade, radiant tubes, high alloy steel pipes, heat-resistance furnace rollers, fire grates for refuse incinerators, all kinds of alloy guide rails, guide plates and guide rollers for steel rolling industry. Our products are widely used in heat-treatment, metallurgy and steel rolling industries. With precision casting process, various kinds of heat & wear-resistant castings are manufactured, containing high nickel & high chromium alloys, such as ASTM A 297 HH, HK series, JIS SCH13, SCH15, SCH21, DIN 1.4848, 1.4879, G-X 260 CrMo 18 2, G-X 300 CrMo 18 1, G-X 300 CrMo 25 1. Spraying centrifugal casting process is one of our core technologies. With the process, we can produce centrifugal cast pipes with the diameter from 50 mm-1000 mm with smooth surface, compact structure, higher pressure-resistance: longer service life in 800 ℃~1200 ℃ at 3~4 Mpa pressure. The centrifugal castings are radiant tubes, reheating furnace rollers, high alloy steel bushings, etc. Our foundry has necessary production and machining facilities, such as mid-frequency induction electrical furnaces, centrifugal casting machine, blast shots, etc.. Test facilities include Oxford Spectrometer for chemical analysis, HS hardness tester, high-temperature Lab Electrical Furnace. These equipments are used to ensure the consistent quality of our castings. We achieved the certificate of quality management system ISO 9001:2008. Our heat and wear castings have been exported to oversea market, such as Japan, Germany.We have a good credit of delivery of products in accordance with the contracts. 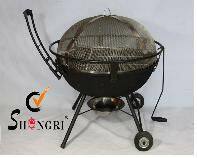 Posted By: Wuxi Junteng Fanghu Alloy Casting Co.,Ltd. 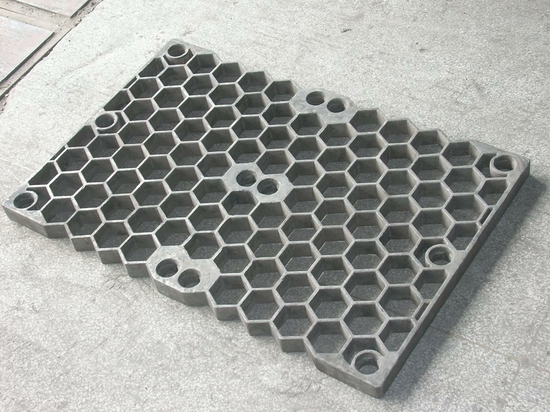 Business Description: Wuxi Junteng Fanghu Alloy Casting Co.,Ltd. specializes in the production of heat & wear resistant alloy steel castings with precision & centrifugal casting & resin sand molding processes.Our current capacity of finished castings is 5000 tons / year. Our main products include heat treatment fixture castings, heat treatment fan blade, radiant tubes, high alloy steel pipes, heat resistance furnace rollers, fire grates for refuse incinerators, all kinds of alloy guide rails,guide plates and guide rollers for steel rolling industry. Our products are widely used in heat treatment, metallurgy and steel rolling industries. With precision casting process,various kinds of heat & wear resistant castings are manufactured,containing high nickel & high chromium alloys,such as ASTM A 297 HH、HK series, JIS SCH13、SCH15、SCH21, DIN 1.4848、1.4879, G X 260 CrMo 18 2、G X 300 CrMo 18 1、G X 300 CrMo 25 1. Spraying centrifugal casting process is one of our core technologies. With the process, we can produce centrifugal cast pipes with the diameter from 50 mm 1000 mm with smooth surface,compact structure, higher pressure resistance: longer service life in 800 ℃~1200 ℃ at 3~4 Mpa pressure. 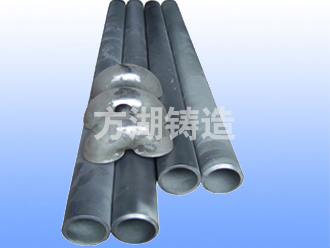 The centrifugal castings are radiant tubes, reheating furnace rollers, high alloy steel bushings, etc. Our foundry has necessary production and machining facilities, such as mid frequency induction electrical furnaces, centrifugal casting machine,blast shots, etc.. Test facilities include Oxford Spectrometer for chemical analysis, HS hardness tester, high temperature Lab Electrical Furnace. These equipments are used to ensure the consistent quality of our castings. We achieved the certificate of quality management system ISO 9001:2008. Our heat and wear castings have been exported to oversea market,such as Japan,Germany.We have a good credit of delivery of products in accordance with the contracts.